Tips! Make sure your resume is accurate and has proper spelling and punctuation. Once you drop your resume or application off with an employer remember to check back 1-2 days later with the hiring manager and let them know that you are really interested in working for the company. Junction City is currently accepting applications for the position of Lifeguard for the 2019 swim season at the Max Strauss Swimming Pool. All applicants must be 15 years of age or older, American Red Cross Lifeguard certified or able to complete certification training prior to employment (training offered locally 5/17, 5/18, 5/19, 5/31, 6/1 and 6/2; must attend all dates, to complete training (call 541-998-4767 to sign up for training), able to swim 300 continuous yards, and complete a timed physical challenge. Completion of training is not a guarantee of employment. See our website for additional information. Applications must be submitted to City Hall by 5:00pm on 5/10/19. Please contact (541) 998-4767 or (541) 998-4775 with any questions. Applications and full job descriptions are available at City Hall, 680 Greenwood, Junction City or at www.junctioncityoregon.gov. 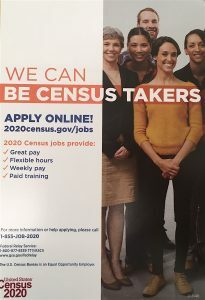 To apply submit a completed application at City Hall or mail to PO Box 250, Junction City, Oregon 97448 Attn: Human Resources. EOE/AA. Capella Market has a need for bright and motivated high school students. Our courtesy clerk position involves bagging groceries, doing carry outs, cleaning bathrooms and other parts of the store, and processing recycling and other duties as assigned. It’s a great introduction to the work place, to the fundamentals of customer service, and how to work. Hours: primarily evenings and weekends. Pay: minimum wage. It’s common for courtesy clerks to be promoted into other departments once they have shown that they are responsible, hard workers. Pick up an application up at Capella Market, 2489 Willamette St.
I’m pleased to tell students that the seasonal firefighting job posting can now be found online. The job can be found here. 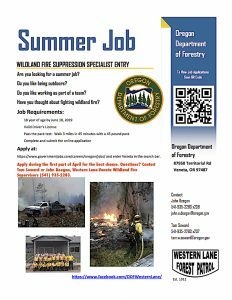 Students can also google “Oregon job opportunities” look under the Workday tab, click “find and apply for jobs”, type “Veneta” in the search bar and find the Wildland Fire suppression Specialist Entry job. Please encourage students to apply as soon as possible! Application deadline is June 1, 2019. Applicants must be at least 18 years old at time of hire. Burrito Boy West 11th Ave.
Hawaiian Time http://www.hawaiiantime.com/jobs/ print application and take it to the store you want to work at. KFC Bring resume, complete application at store location. RS Plumbing Bring resume, complete application at store. Sunglass Hut Bring resume, complete application at store.